Okay guys. I'm going to venture into my first attempt at saltwater. I've read and researched for years, but finally now am in a position where I can really afford to give it a go. My main question is where to really begin. I have an empty 10 gallon from my old freshwater set up. But it's literally just the tank now. As a total noob is it advisable to just use that tank, and attempt to modify it for a small reef? Or should I just go out and grab an EVO kit and dump the old tank? My biggest concern is in the DIY portions. I'm not incredibly handy, and have very limited tools at my disposable. Basically just a screwdriver, hammer and handsaw. I only plan on keeping live rock, inverts and some easy corals in this first tank. I don't want to bite off more than I can chew and ruin the hobby for myself. Thanks guys! For you I would suggest an AIO. That way you know what accessories fit your brand/model and can search Nano-Reef to see what other reefers have done. Plus, you can upgrade your tank as you learn and grow. Very true, but no matter what system you buy someone somewhere has had an issue with it. The call is ultimately yours. I thought the 5 may be less work to set up, with everything else I have going on, but I've wanted a reef tank since I could read, so I know I'll have to get the 13.5. There's too many pretty corals out there not to! Plus my FW has been up almost a year in its current state, so it runs itself now. Although. I may just start with the 5 and once i get that up and going pick up a bigger tank down the line. Make sure it's a hobby I can stick to. I honestly get so so sad seeing neglected tanks. I had a Betta sorority because i saw them in their cups at Walmart and couldnt leave them. I'm down to just one girl. She was the worst off and has lasted the longest. I swear she knows too. I catch her staring at me sometimes lol. Go with evo, Ive been really happy with it and has a lot of upgrade options for down the road as you get more experience in reef keeping. There are very affordable upgrades and lots of diy on forums here too. 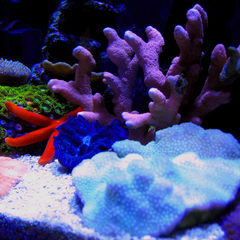 All you would need is sand, live rock, heater, salt mix, hydrometer, distilled water or reverse osmosis/deionized water from your lfs and your on your way to grow most corals. Also recommend water changes every two weeks, I get a bucket and throw 3 gallons of rodi water and make a fresh batch of salt water for a quick 10 percent water change. Future upgrades I would recommend upgraded return pump, power head, light upgrade.